After finding success with short films such as Paperman and Get a Horse, Walt Disney Animation Studios has released a sneak peek at their latest animated effort Feast, which will be attached to prints of Disney's Big Hero 6 in theaters on November 7. First-time director Patrick Osborne, who served as the head of animation on Paperman, takes the helm for Walt Disney Animation Studios' story of one man's love life as seen through the eyes of his best friend and dog, Winston, and revealed bite by bite through the meals they share. This sneak preview shows Winston's progression from a shy puppy too nervous to take a french fry, to a growing dog who "feasts" on everything from nachos, pizza, ham, and, as a possible homage to Lady and the Tramp, a plate of spaghetti and meatballs. 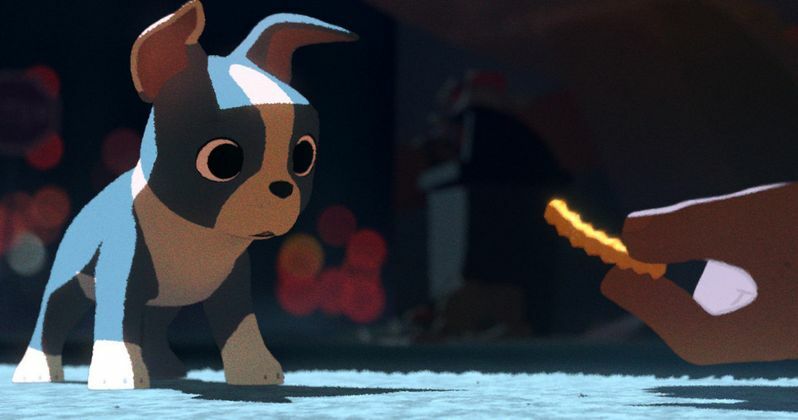 Watch as this puppy grows before your very eyes, before he sets off on a journey of his own in the first footage from Feast.